We were picked up of the port. The location wss great and the room was really nice. This was a really comfortable and spacious apartment. It was really helpful having a transfer from the port, and the owner was really helpful in introducing us to the area. The location is only a 15min walk from the port, and the beach is just down the road. Would definitely come back! The owner is genuinely accommodating. He picked us up from and dropped us back to the port and gave us information about the island. Highly appreciated! Very spacious room. 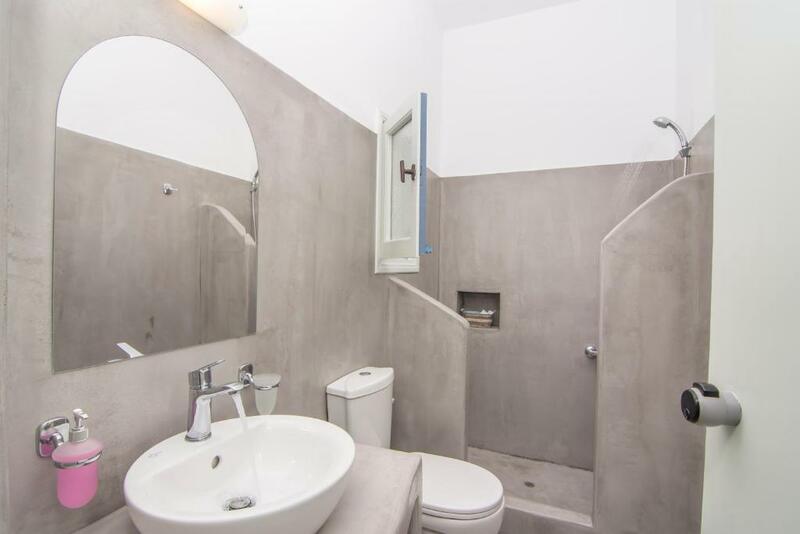 Nice renovated bathroom. The apartment was quite a walk from the port and bus station which was inconvenient as almost every day during our stay we would use the bus to go to Naoussa. That being said, the apartment was not far at all from the beach and some great restaurants and taverns. Spyros the owner was great from the moment we booked, arranging us free transfers to and from the port and giving us great recommendations on where to eat and visit during our stay. He was very welcoming and made every effort to ensure our stay was enjoyable. 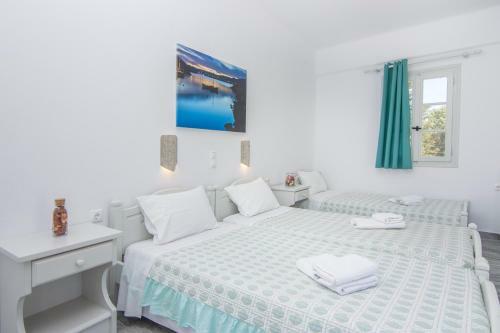 Lovely studio near the beach... and the port was just a short walk! 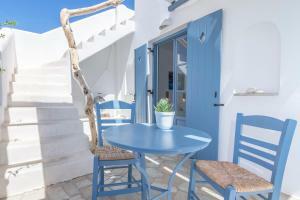 Proximity to the beach and good local traditional tavernas. Host friendly and helpful. Everything here that is needed for a short stay. 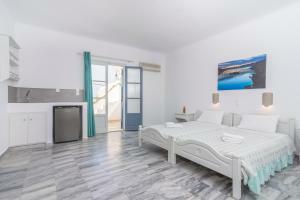 Lock in a great price for Magginas Studio-Apartments – rated 9.2 by recent guests! One of our top picks in Parikia.The Cycladic-style Magginas Studio-Apartments is located just a few feet from the beach and close to Parikia town center. 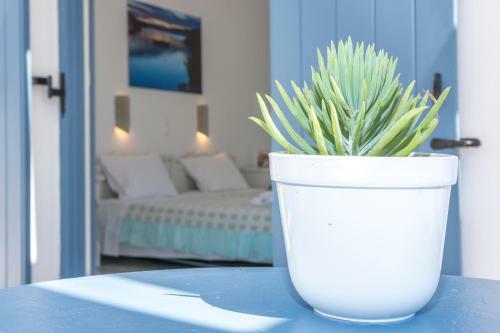 It offers air-conditioned accommodations with free Wi-Fi and private balcony. A fridge and TV are included in all accommodations types at the Eco-friendly Magginas. Some units offer a kitchenette with cooking facilities and coffee machine. Surrounding the hotel, there is a private garden for guests to relax in and enjoy the Mediterranean sun. Staff at the 24-hour front desk can arrange car and bicycle rental. 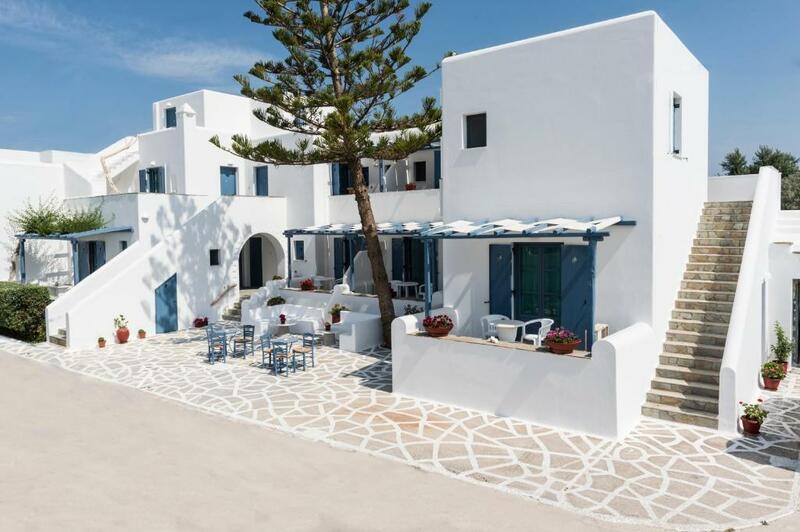 Parikia Port is within a 5-minute walk from the property. Restaurants, bars and shops can be found within 350 feet. Free private parking is available on site. This is our guests' favorite part of Parikia, according to independent reviews. 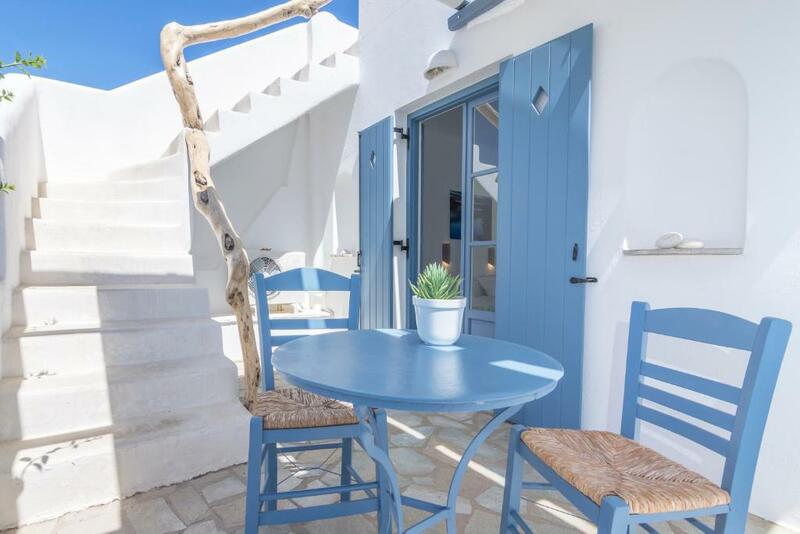 This property also has one of the top-rated locations in Parikia! Guests are happier about it compared to other properties in the area. 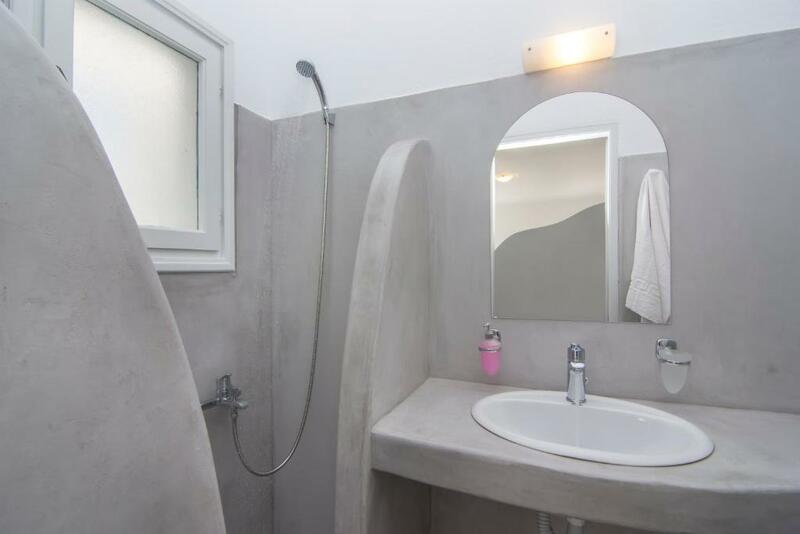 This property is also rated for the best value in Parikia! Guests are getting more for their money when compared to other properties in this city. 뀐 Located in the top-rated area in Parikia, this property has an excellent location score of 9.5! When would you like to stay at Magginas Studio-Apartments? Features kitchenette, cooking facilities and fridge. Includes a TV, free Wi-Fi, air conditioning and private balcony. 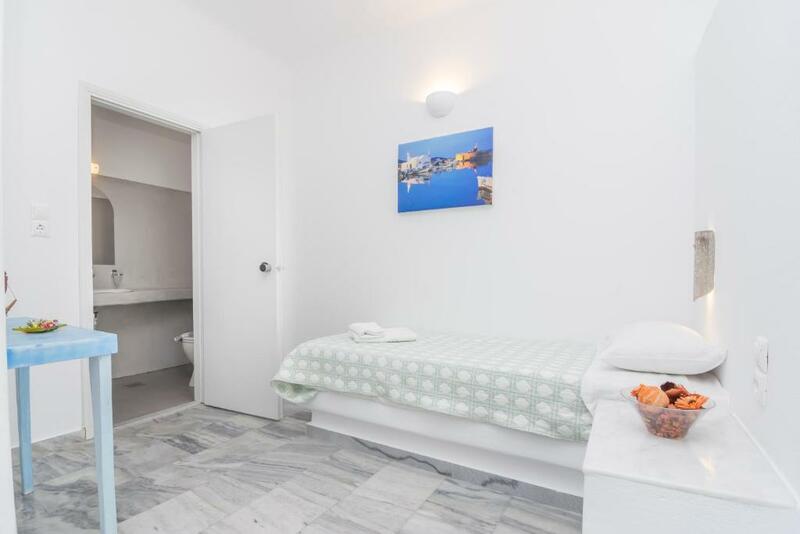 Τα Maggina's Studio - Apartments είναι μια οικογενειακή επιχείρηση. Την κατασκευή των δωματίων την πραγματοποίησε ο πατέρας μου, για αυτό και εγώ με την βοήθεια της οικογένειάς μου φροντίζουμε για την συντήρηση και τη σωστή λειτουργία τους. Βρίσκονται πολύ κοντά στο κέντρο της πόλης και το λιμάνι, μόλις 10 λεπτά με τα πόδια, ενώ η πιο κοντινή παραλία απέχει μόλις 20 μέτρα! Ονομάζομαι Magginas Spyros και είμαι ο ιδιοκτήτης αλλά και διαχειριστής των Magginas Studio - Apartments. Κατάγομαι από την Πάρο όπου και μεγάλωσα. Είμαι πτυχιούχος μηχανικός δομικών έργων κι επιμελήθηκα προσωπικά την ανακαίνιση του συγκροτήματος. Είμαι νέος επιχειρηματίας με όρεξη και φιλοδοξίες. Το συγκρότημά μας βρίσκεται στην περιοχή Λιβάδια, 10 λεπτά από το κέντρο της Παροικίας. Παρόλο που είναι κοντά στο κέντρο, η γειτονιά μας είναι ήσυχη, δίπλα στη θάλασσα με παραθαλάσσια μαγαζιά για κάθε ώρα της ημέρας και για κάθε γούστο. Στα 100 μόλις μέτρα υπάρχει η οργανωμένη και πολυσύχναστη παραλία των Λιβαδιών. Το κατάλυμα μας βρίσκεται 20 μέτρα από τη θάλασσα σε έναν δρόμο που καταλήγει σε αδιέξοδο και για αυτό το λόγο η διαμονή είναι ευχάριστη χωρίς φασαρία και κίνηση. Διατίθεται επίσης χώρος παρκαρίσματος οχημάτων. House Rules Magginas Studio-Apartments takes special requests – add in the next step! Magginas Studio-Apartments accepts these cards and reserves the right to temporarily hold an amount prior to arrival. Please note that Magginas Studio-Apartments offers free transfer from/to the port. Guests are kindly requested to inform the property in advance if they wish to make use of this service. Contact details can be found on the booking confirmation. Please inform Magginas Studio-Apartments of your expected arrival time in advance. You can use the Special Requests box when booking, or contact the property directly using the contact details in your confirmation. Nothing! Would definitely go back. Spyros is a superb host, we contacted him from Mykonos and he arranged to collect us from the Port. Whilst he drove us to his apartments (2mins)he pointed out Pepe’s souvlaki which had really excellent food. On arrival he then indicated from an island map in your room which beaches to visit. He is superb as a host and nothing wood trouble him. Furniture and fridge could be renewed. Maybe the mattress was little be thin...otherwise very very nice moment!! Spyros is a wonderful and helpful guy! The room overall was a 3 star - the room itself was not very spacious and looked out-dated and although the bathroom looked renovated, it was very small. The beds also were not comfortable at all. The room would get quite humid and muggy and the aircon would shut off unexpectedly. There is no reception and the only way to contact the owner was by mobile. There was a lot of noise during the night and morning which sounded like banging and as if people were moving furniture in the apartment above us, making it difficult to sleep. We released on our last night that the sound was coming from the large door shutters which kept banging because the latch was very loose.